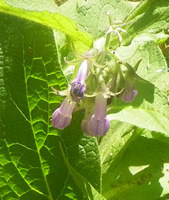 Comfrey makes a mild tasting amber brew that is good for special occasions, like mending from broken bones, or severe colds and coughs. Cautions: Internal use has become controversial due to the high content of PAs, however the be herb has been used by both humans and animals safely for centuries. (use your own judgement and common sense). The dried leaves have a much lower PA content than the fresh leaves or the roots. Recipe Instructions: Herbal Tea :For tea use 1 teaspoon of cut and dried leaves for each cup of hot water. Infuse in hot water until cool enough to drink, about 10 minutes. For bath blends fill a muslin bag with dried or fresh leaves and soak away. Comfrey is my number one favorite bath herb to use when my skin needs extra healing. Cough :Homemade cough syrups and herbal medicine teas make use of simple ingredients like honey and infused with healing herbs. Rashes :Poison ivy, allergic reactions, flea and insect bites, diaper rash - these can all be treated at home using your own herbal remedies.